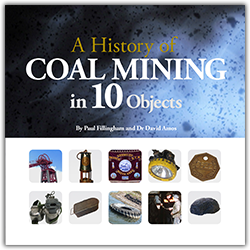 A History of Coal Mining in 10 Objects is part of a wider Arts and Humanities Research Council project: Archives, Assets and Audiences involving the Universities of Nottingham and Leicester. One of several archival research projects conducted in 2013, the project sought to explore new modes of audience engagement using archival content and heritage sites. Working with Historian Dr David Amos, Principal Investigator Dr Sarah Badcock (University of Nottingham) and the Bilsthorpe Heritage Society, Producer Paul Fillingham engaged with former mineworkers, their families and members of the public in telling the story of coal mining in the East Midlands. Each of the selected ten objects were associated with cultural themes, expressed through digital media, film, storytelling and essays. Some footage was shot by student film-makers at the D.H. Lawrence Birthplace Museum and underground at the National Coal Mining Museum for England. The screenplay for Snap Tin was inspired by political debate that often occurred during underground lunch breaks. The title refers to the metal, waterproof lunch-boxes that were carried by miners. The term ‘snap’ means food in local Nottinghamshire dialect. The phrase ‘snap can’ also appears in The Road to Wigan Pier by George Orwell where he describes miners’ eating habits. Conversation at ‘snap time’ conducted hundreds of feet underground would often expose the generational divide between old-timers and trainees. This theme is explored in the film which mixes different mining eras and political conflicts. The film also contains references to literary works by George Orwell, Harper Lee, and G.A.W. Tomlinson and concludes with the phrase ‘Young men dream, old men remember’. Another film-piece; Headstocks featuring former Mining Surveyor Robert Bradley, documents the history of the iconic headstock or winding gear. Here, oral history is supported by archive footage and motion graphics. During the project, research at the mining union headquarters which was due for demolition, resulted in the discovery of fourteen colliery banners which were subsequently digitised and earmarked for future restoration. 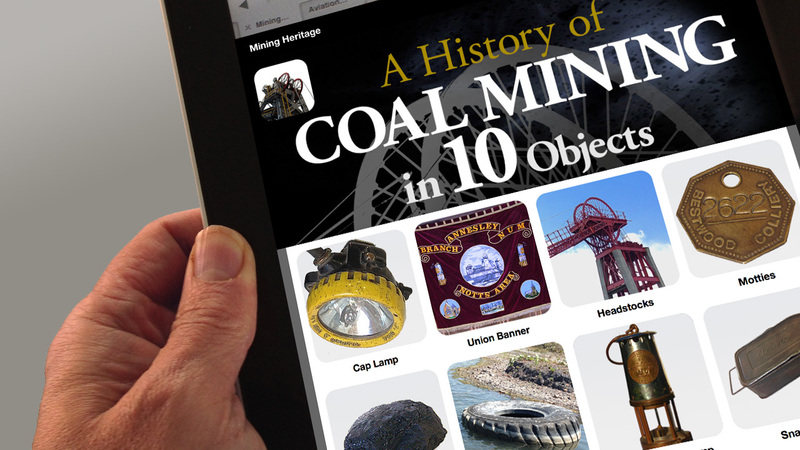 A History of Coal Mining in 10 Objects responsive design on Apple iPad. 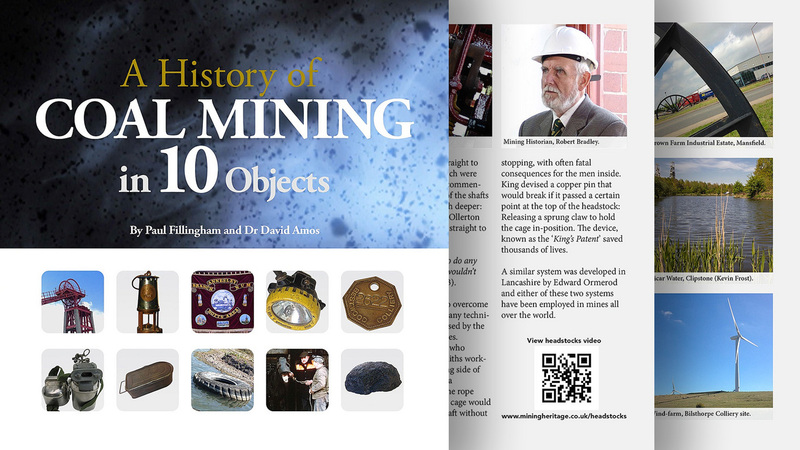 The project inspired other digital heritage projects, including the production of school curriculum materials for Bestwood Colliery Winding Engine House Museum, and the establishment of a Mining Banner Heritage Trust to guarantee the preservation of the union banners. 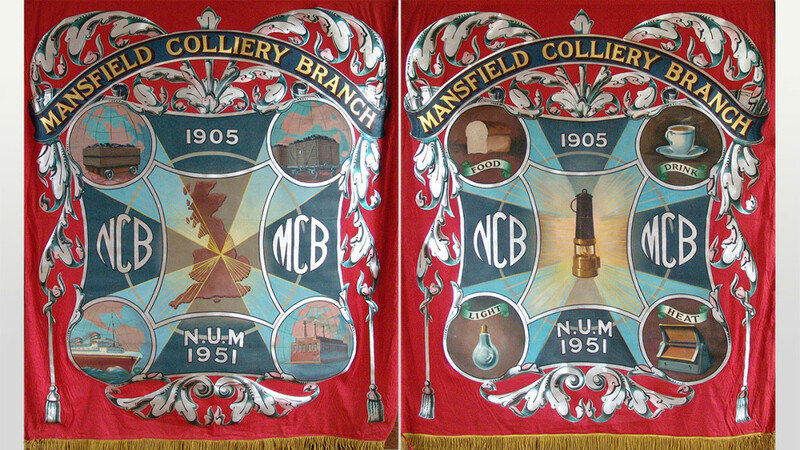 Recovered Mansfield (Crown Farm) Colliery Banner with 1951 Festival of Britain styling. Community outreach and training activities in former coalfields continue through Mine2Minds Education a not-for-profit community interest organisation headed by co-producers; Dr David Amos and Paul Fillingham.